I met Tosin in my previous career, and recently we reconnected over entrepreneurship and the power of plants. We both left the retail industry to pursue a goal with the greater good in mind, and both have found ways to utilize the skills we learned in our prior career to take our social entrepreneurship to the next level. *The coupon code "FARMERSFRIEND” will be active starting 12 am on 9/24 and ending 11:59 pm on 10/24. Read below to learn more about Holistic Remedies LLC and their story! Who are the entrepreneurs behind Holistic Remedies LLC, and what inspired your brand? 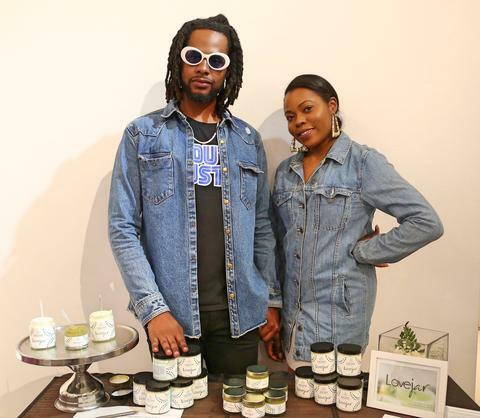 Tosin and Isaiah are the entrepreneurs behind Holistic Remedies LLC. We have been together for over seven years and have always bonded around our love for cannabis. We were inspired to break the negative stigma that is associated with the plant, and thus Love in a Jar was created in Isaiah’s basement. Isaiah and Tosin both drew from their natural talents to create their product line. Isaiah’s interest in creating and botany, coupled perfectly with Tosin’s love for helping people and her administrative background. Our love was the perfect recipe for Holistic Remedies to be created. Where are you from? Where is your brand based? Tosin is from Brooklyn originally, but moved to central NJ in middle school. She is now residing in East Orange. Isaiah is a NJ native, currently residing in Union, NJ. Our biggest audience for Holistic Remedies is in NY. What are your favorite ways to use your products? What has been your favorite part of starting a business? Creativity with branding and marketing, networking/ meeting new people, introducing our brand to new customers, enlightening people about the holistic benefits of cannabis. Running into unforeseen roadblocks that derive because we sell cannabis infused products. For example, we can only sell our hemp body butter on FB and IG, not our CBD healing balm. Another challenge has been increasing traffic to the website. Why do you believe small, local businesses are important? Because it keeps our local economy booming, creating jobs in the community. Also, small business owners give back to the community ( ie; Our upcoming Back to school Drive), and it’s good to help make your neighbors more money instead of pouring dollars into multi-million dollar businesses who don’t value their customers as much as a small business would. How did you build your ingredients for your products? What made you decide to focus on hemp and CBD based products? We were already interested in Cannabis because we enjoy using it. With cannabis legalization on the rise, we knew we wanted to be a part of the economic growth. Tosin also has parents who experience pain, and she works with patients who have pain too. Lots of people aren’t able to get relief from their prescriptions, and cannabis helps tremendously with pain. This intrigued to use this ingredient in our products. If you could only define your brand in one sentence, what would you say? Inspired by Hemp and Cannabis, Holistic Remedies was created out of love for the mind, body and spirit. What is your opinion on the City of East Orange, and in what ways would you like to see the city change/remain the same? We like that East Orange is an up and coming area, close to NY and highways. We like that the Mayor Ted Green makes himself available for his community. We like that East Orange has a multitude of different property types- you can find high rise buildings, residential areas, commercial real estate, etc. We want to see the parking rules lighten up and allow street parking after 2 am. Hemp oil is loaded with nourishment! It's skin-strengthening properties allow the body to resist infection and can improve eczema, dermatitis, psoriasis, and acne. Every time you use our Body Butter, you will receive the following benefits. • Vitamin E: a strong antioxidant with anti-aging properties. Effective for treating cancer, arthritis and cataracts. • Vitamin A: repairs skin damage from sun exposure and aging. Original Scent: Light, fruity scent that captures the aroma of strawberries, passion fruit, and peaches- to name a few! Rose gold: Bold, floral scent that fuses rose, lilac and a splash of lavender to leave you feeling delicate and fresh! Cinnamon Citrus: Warm, spicy scent with a unique citrus zest!. The "Love in a Jar" Healing Balm is formulated with 150 mg of CBD, and uses synergistic essential oils. It's peppermint-menthol scent will leave you refreshed and invigorated the moment you open the jar. When you rub our Healing Balm onto your joints, the CBD uses its anti-inflammatory qualities to provide immediate and long-lasting relief on your specific body part. • Made with 7 unique plant extracts. Be sure to follow Holistic Remedies LLC on their journey.